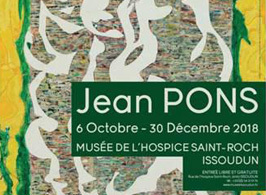 The Museum of Saint-Roch presents a retrospective exhibition dedicated to the painter Jean Pons (1913-2005), whose Parisian renowned studio of lithography was frequented by major artists of the second half of the 20th century: from Bram van Velde to Appel, from Nicolas de Stael to Poliakoff, from Hartung to Lapique. This exhibition brings together almost 80 paintings and redraws the journey of a singular and sensitive artist, from the 1940s to the 2000s, gathered from private collections. - During the years 1945-1947: Jean Pons painted and participated in multiple Salons (Salon des Indépendants, Salon des moins de trente ans, Salon des Tuileries, Salon d’Automne…). His figures evoke geometric shapes. his colour palette is frank and contrasted. Little by little, his painting evolves towards an abstraction more radical. He met Aimé Césaire who became his friend. He created from that time paintings inspired by his friend’s poetry. - In the 1960s: Jean Pons painted with a growing freedom and in a more and more personal style. He freed himself from rules. He painted with sponges in which appear faces and human or animal silhouettes. He also practiced collage to evoke universes sometimes close to Max Ernst’s. - In the 1990s and 2000s: installed in Eygalières in the South of France, Jean Pons pursued his work returning to the techniques he had practiced in the sixties, but with a more enlightened way where we can distinguish faces or horses’ silhouettes. - Lydia Harambourg : historienne et critique d’art.